I’ve been meaning to see this since I first heard it existed (in movie form; I don’t follow musical theatre enough to know the play), so I’m really glad to have the push to get to it. I’m a big fan of movie musicals, especially ones confident enough to maintain wall-to-wall singing and a small scale, both of which The Last Five Years does. The last five years cover the relationship of Jamie and Cathy, respectively an aspiring writer and an aspiring actress who meet in New York, fall in love and then gradually grow further apart. It’s no spoiler to say how it ends up, since the opening line of the film is “Jamie is gone.” The structure tells the stories both directions – Cathy’s point of view going backwards, from breakup to courtship, and Jamie’s going forwards. If this structure sounds somewhat familiar, you may have seen Blue Valentine, with Ryan Gosling and Michelle Williams’ characters undergoing a similar relationship trajectory with a similar dual structure. But this time, there’s music! I’ll confess, Blue Valentine hit me pretty hard, and The Last Five Years didn’t hit me as hard – probably in part because I saw Blue Valentine first, but also because The Last Five Years honestly isn’t quite as devastating. Oh, it’s devastating, Jamie and Cathy aren’t really AS mean to each other as the characters in Blue Valentine, plus there’s no kid involved, plus the wall-to-wall singing, as poignant and visceral as the songs often are (both musically and lyrically), kind of softens it a bit. Though that sounds like I rate Blue Valentine higher (and it is higher right now on my Flickchart), I certainly found The Last Five Years a more enjoyable watch, and I’d definitely want to return to it more often. The best thing in The Last Five Years, aside from the music, is that it doesn’t really place too much of the blame on either person, or even make any external judgements; it really just presents their emotions without taking any narrative distance at all, leaving a lot of interpretation up to the viewer. Yes, Jamie ends up acting like quite a douche in a lot of ways, but when one spouse is successful in their career and the other isn’t, and neither feel like they’re getting the support they need, it’s kind of a hard situation to navigate for BOTH people, and I think the film did a good job of portraying that. I think I may need to watch it again to suss out more completely how I feel about their relationship. Apparently in the original play, only one person was onstage singing their song at a time (except for the wedding scene in the middle), but the film has them both onscreen together throughout most of it, and seeing their reactions I think really helps drive the emotion home. Just watch Kendrick’s face when Jamie is singing “If I Didn’t Believe In You” – it’s exquisite. 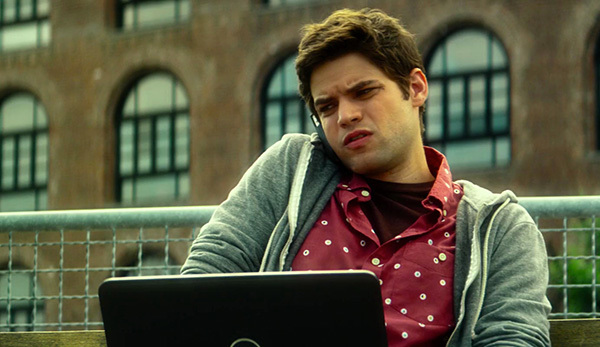 Both of the actors are great, actually; I expected Kendrick to be great because she always is, but Jeremy Jordan is pretty much a newcomer to the screen (he’s been on Broadway, though not in this show, and on the TV show Smash), and he matches her pretty much beat for beat. The final scene, which connects the end of his timeline with the beginning of hers, is pretty great, and really shows the excellent adaptation from stage to screen, because there are things done with the camera, hiding and revealing the characters at different times in the shot in a way that can’t be easily done on stage and is very effective. Throughout I noted really solid camera work – not too flashy, and with a BIT too much handheld, but for the most part effective and thoughtful. The scene where Jamie sings his story of Schmuel, for example, uses some focal length effects that serve to set his narrative apart from the Cathy’s reactions, even though they’re both just in their tiny apartment. It is now my #3 Anna Kendrick film, my #62 Musical, and my #3 film of 2014 (which is not quite right, but my 2014 films are all out of whack – should be around #5). I’m curious how this will come out once I get through reranking my 500-800 or so, because there are definitely problem areas in there that could cause this to move up or down. This feels about right at the moment, though. The Last Five Years was recommended by Hannah Keefer, a friend from the Flickcharters Group on Facebook. Averaging together this #596 ranking with my #304 ranking of her other film, My Cousin Vinny, Hannah gets an average ranking of #450. Cathy: Jamie is over and Jamie is gone. / Jamie’s decided it’s time to move on. / Jamie has new dreams he’s building upon. / And I’m still hurting. Jamie: What the hell is an agent retreat? Cathy: I don’t know, they go into the woods and sacrifice actresses to breed more agents. I’m glad you liked it pretty well. The single moment that devastates me the most is when Cathy sings “Goodbye until tomorrow/Goodbye until I’m done thanking God.” In that moment you realize how invested she was in the relief that her search had come to its end. Alas, it had not.